Sun glare and speed are cited as factors from a March 6 crash between a South Dearborn Community Schools bus and a Rumpke trash truck. Photo courtesy of the Indiana State Police. The Indiana State Police (ISP) cited sun glare and speed as factors that contributed to a school bus crash on March 6 that injured over two dozen people, reported Eagle Country Online. The crash on State Road 350 occurred between a South Dearborn Community Schools bus and a Rumpke trash truck. The report said 25 people were injured in the crash, 23 of which were students. One student was pinned in his seat as a result of the crash and had to be extricated by first responders, the article reported. 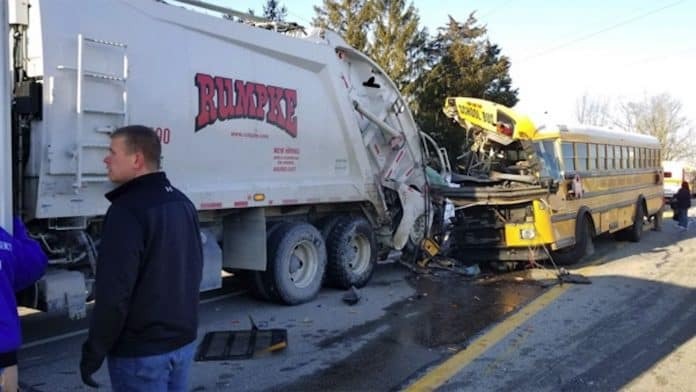 According to the ISP preliminary investigation report, the bus driver was blinded by the rising sun and was driving too fast, prior to rear-ending the garbage truck. The garbage truck was pushed forward 40 feet after impact. The school bus was equipped with an onboard video camera, but ISP said no surveillance footage is available that shows the crash. ISP said the bus driver has not been charged, as it is still completing the investigation, the article said.